While we are really glad we spent time on the mainland Mexican coast this year, we’ve been reminded these past two weeks of why we love the Sea of Cortez. 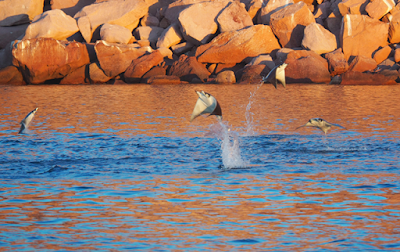 Mobula rays are a type of manta ray that frequent the waters of the Sea of Cortez. Typically they travel alone, and can often be seen leaping out of the water for reasons unknown. Unfortunately there hasn’t been a lot of research done on these wonderful creatures and so many of their behaviours are a mystery. While we’ve seen many rays in our 3 years in the Sea, this year was spectacular. 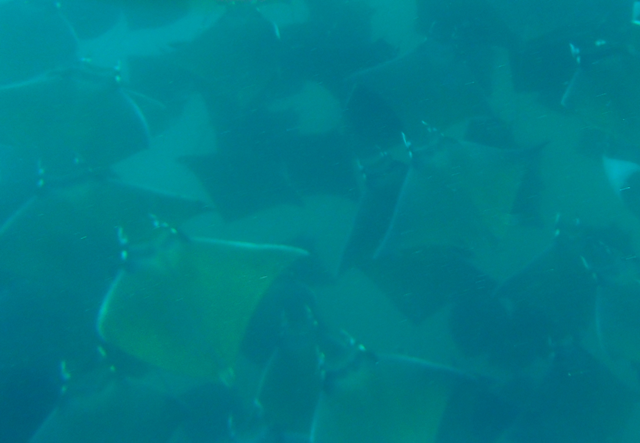 It turns out that April is ‘mating month’ and so the rays have been congregating in huge groups. The group circles under the water while several rays at a time leap out of the water and do a belly flop. 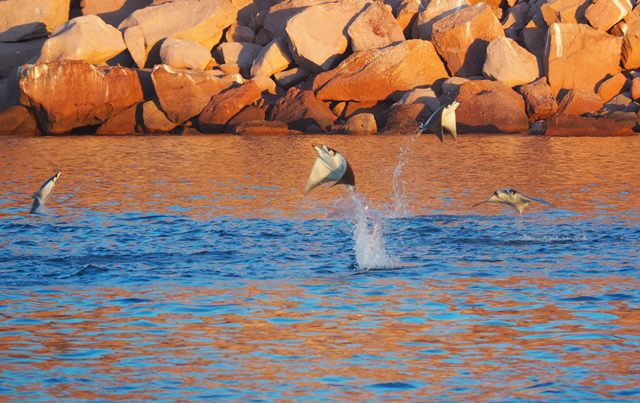 We speculate that this is part of the mating ritual – may the best belly flop win! The rays then seem to pair off and there is a frenzy of activity on the surface as they ‘chase’ each other around. 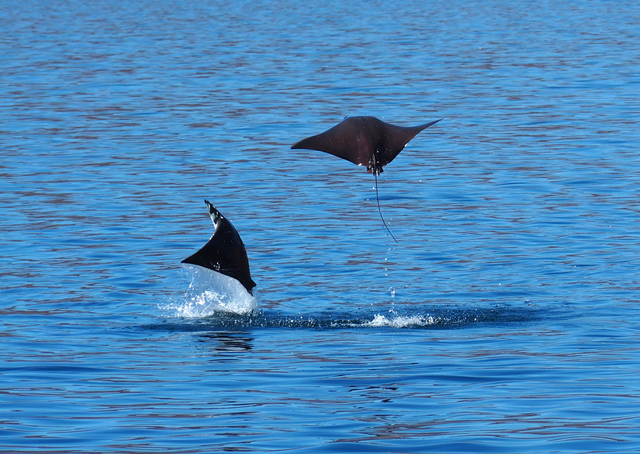 As luck would have it, we’d been lucky enough to encounter a number of these ray groupings over the last few weeks. It is just nice to sit and watch them, which Gary and I have been able to do in pretty much every anchorage we’ve gone into in the last 2 weeks. 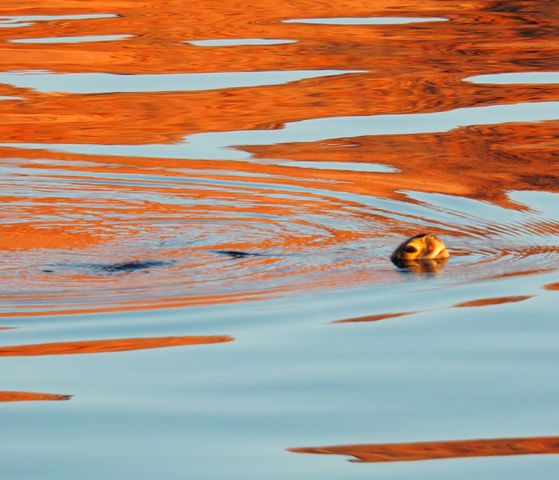 Grebes are pretty common in the Sea of Cortez, but there seem to be more of them than usual. They have provided endless entertainment as we’ve watched them all dive as a group, and come up as a group. Some of the groups we’ve seen have been huge – up to several hundred birds. Despite all the dolphin shows we’ve been privy to in the last 3 years, it is still a thrill when a pod stops by to play. Spinner dolphins are especially fun to watch as they like to leap out of the water around the boat. We’ve been lucky in the whale department these last few weeks as well. On a quiet motor a few days ago we encountered a curious Minke whale. 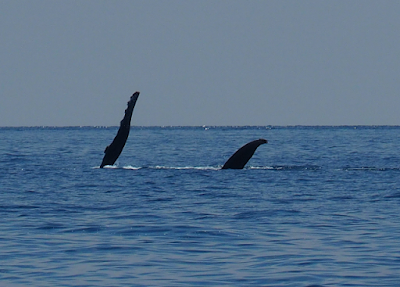 He surfaced just off the port side and so we stopped the boat and floated while he circled us 3 times. On his last pass, he was less than a boat length away. While only about 30 feet or so, he was still very impressive. I’m glad he was only curious! 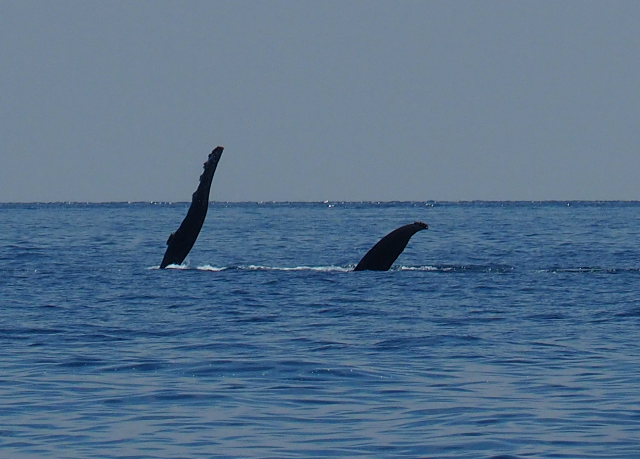 We’ve also seen a number of humpback whales on our trip north. We’ve seen them leaping and slapping the water with their fins. All very cool. This has been a great year for turtles. We’ve never seen so many, both in the south and in the Sea! 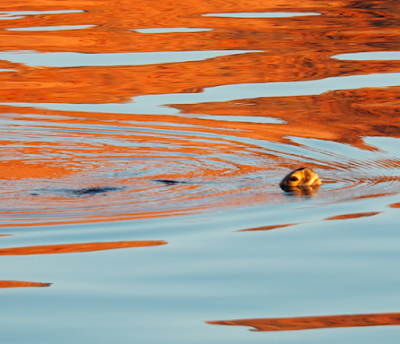 Every anchorage has had at least 2 turtles swimming around. I spent one day trying to get a good picture of one, but they are shy creatures. Sorry, the picture here is the best I got. This morning the cry of gulls brought Gary and I up to the cockpit, where we watched a couple of gulls force a vulture into the water. Vultures are not sea birds. They aren’t very good swimmers and can’t take off from the water. So basically the poor guy was screwed. The gulls continued to dive bomb the poor thing while he bobbed in the water. He eventually doggy-paddled his was over to our boat and seemed desperate to get out. Gary got a bucket and I got into the dinghy. The vulture came right over to me and latched onto the side of the bucket. I then semi-scooped him out of the water while he clung to the side with his wings spread wide for balance. The gulls looked on in disgust. Now what? I was sitting in the dinghy with a huge vulture on the other side of a bucket from me. I gently put the bucket in the bottom of the dinghy. While he made a move from the bucket to the dinghy seat, I made a hasty retreat. He then sat on the dinghy seat looking pathetic for the next few hours while his feathers dried. The gulls were incredibly persistent and continued to dive bomb him at regular intervals. If we heard them coming, either Gary or I would go and stand on deck, which would deter the gulls from a full attack. I don’t think we made any gull friends today. After about 3 hours he did a test flight and landed on the solar panel. After a quick thank you, he took off for shore, with about 5 gulls in hot pursuit. 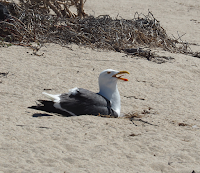 The gulls forced him back into the water just as he got to shore, but he managed to crawl up onto the rocks. The last we saw he was cowering beside a rock while the gulls continued to harass him. 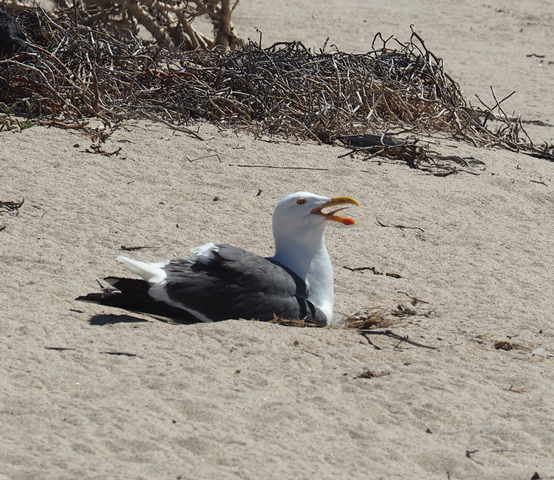 The lesson here: don’t piss off a gull. They know how to hold grudges. It’s the Sea of Cortez... Need I say more? Our time here is almost up. Tomorrow we will cross the Sea of Cortez back to Guyamas, where we will work furiously for the next week to put the boat to bed for another year. Overall it has been a great season. We travelled to some wonderful new areas, swam in warm waters, made new friends, experienced a ton of wildlife and traveled some major distances (roughly 3300 nm). Unfortunately we didn’t end up sailing as much as we’d have liked, but the gentler weather we experienced instead has been a nice change. We’ll definitely miss Mexico next year when we leave to explore countries further south. After our first year of Cruising, Gary decided we would buy a sewing machine and start making “useful things” for the boat. The first project he had in mind was replacing our ageing stack pack (the bag that holds the main sail on the boom and protects it from UV). I thought this was kind of ambitious for people who’d never touched a sewing machine before, but agreed we should give it a try. First things first. We needed a sewing machine. And not just any machine, but one that would sew sail cloth and multiple layers of heavy duty canvas material. As you can imagine, there aren’t very many machines that fit the bill. While most Cruisers spend the big bucks and buy a Sailrite machine, Gary didn’t want to spend the mucho dinero required to purchase one (they almost never come up for sale second hand, and if they do, they are sold instantly). Instead, he began scouring all the sewing shops in Vancouver for the right machine. It turns out that shopping for a sewing machine as a man has its challenges. In every store we went into the sales staff would immediately try to talk to me, not him! I’d stare at them blankly and then Gary would start talking the sewing machine lingo, saying things like “does it have a pressure foot?” and the sales staff’s eyes would widen in shock... It was an entertaining time. After much searching, he settled on a 1940’s vintage German-made Pfaff 130. She is a beauty – black and sleek, but obviously likes her beer and bratwursts, as she is a hefty one. I can barely lift her. Even though she was built in the 40’s she came with an electric foot pedal. We thought this was great until Gary used it for the first time and it started to smoke in our living room... So, his first task in his new career as a ‘sewing machine repair man’ was to re-wire the foot pedal. Gary then spent the summer searching the internet and buying all the materials we’d need to build our stack pack. Even though we didn’t buy a Sailrite machine, we spent many dineros buying all the bits and pieces from them that would be required to complete the project. There were zippers, fasteners, the material itself, the instruction manual, basting tape, pins, needles for the machine, velcro, webbing, the list went on and on. We bundled everything into boxes and drove it down to the boat in Mexico. November 2015: The project began. We used one of the big empty rooms at the Marina Fonatur in Guaymas to spread the material and cut out the pattern following the directions in the Sailrite “how to make a stack pack” manual. We measured, basted, and cut. Then we started to sew. And sew she did! In fact, she sewed so fast that you couldn’t feed the material into the machine fast enough! Since we were dealing with 18 foot long pieces of material (and doing the sewing in the salon area of our boat), this was a problem. It didn’t matter what Gary tried, the speed was either dead slow (hand cranking the wheel) or lightening fast. It turns out Gary is like my mother and you don’t want to be near him when he has a sewing machine in front of him. Needless to say, I started to question whether we should have just had a canvas maker make the stack pack for us...Nevertheless, he persevered and managed to get about half way through the project by the end of the season. Summer 2016: Over the winter Gary had investigated ways to make the machine run slower (ie, in control!). A friend of ours had a similar problem and had added an extra gear to the machine. We got the name of the guy who did the work and Gary contacted him when we got back to BC. The guy was based in Duncan, so Gary put the sewing machine in a rolly suitcase and wheeled it onto the ferry and over to the island. He borrowed my parents car and delivered it to the shop. The guy added the extra gear, and it worked like a charm. Winter 2017: It look us a while to get back to the project this year. We spent a day in Guaymas in November cutting out the final pieces we needed, but now we were down to the hard part. Joining the 2 pieces together (of course we didn’t end up following the pattern), fitting it to the sail, and adding all the bits and pieces required to attach it to the boom. The priority of the project increased in January when the old stack pack finally blew apart in spectacular fashion. So in early March we decided the job had to get finished. We pulled out the machine and tried the sew the first seam, only to discover that the machine had completely seized up over the season and wouldn’t move! Gary reprised his role as ‘sewing machine repair man’ and spent a day taking it apart, oiling everything and then putting it back together. Miraculously, it worked! We then got sidetracked with things like sailing north, but finally managed to get back to the project this week. It took us a day to join the critical front and back pieces together (I was quite proud of us at the end of that), and then it took us a day to mock up how it would fit on the boom. We took final measurements, and spent 9 hours on Friday doing all the fiddly bits. Gary doesn’t do well with fiddly things, so I ended up helping on the machine (usually he doesn’t let me touch his baby). By 6pm it was done. Now the install. Conditions weren’t exactly conducive to trying to do anything on deck, but we both just wanted to get it done. The south wind was howling in the anchorage and it took 2 of us to stop the stack pack from being blown overboard. Gary then broke 2 drill bits and 4 screws trying to install 2 fasteners on the end of the boom... While we battled with the cover, Sea Rover waltzed all over the La Paz anchorage as the tide changed and the wind started to fight against the current. Finally, well after the sun had said goodnight, the install was complete. It looks pretty good if I do say so myself, especially for 2 newbies who really didn’t know what they were doing. There are still a few tweaks to make, but we’ll live with it for the rest of the season and make some changes next year. For the first time ever we are a fully colour coordinated boat, as our bimini, genoa UV strip and stack pack are all grey to match our decks. I made the mistake of pointing out that all the fenders that hang off the back of the boat are still blue...and I think that planted the seed in Gary’s mind as to our next sewing project – grey fender covers! Aaagggghhhhhh!!!!!!!!!!!!!! !